No, these are not my photos but a memorial to Australia’s worst ever disaster. I count myself lucky that my family is far from the regions affected and friends are accounted for. Thank you to the Sky Watch Friday group, Klaus, Sandy, Ivor, Wren, Lousie and Fishing Guy for allowing us to include links to this post. 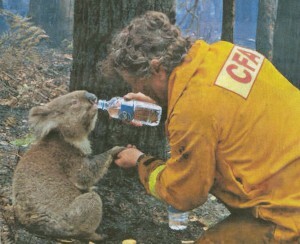 The volunteer CFA (Country Fire Authority) firefighter David Tree has been nominated for an award for his taking the time to care about the plight of wildlife. Click the sky watch button to see the sky from other views all around the world. i have been reading about the terrible fires on the blogs that i visit…what a tragedy, it’s so sad how many have died and lost their homes!!! glad to hear you and your loved ones are out of danger’s reach. when I saw that koala, it broke my heart. Will keep good thoughts going towards Australia. Hello, I am a new visitor. The picture of Sam was on our news the other day, I am glad to know he is well and the other animals are being cared for. The fireman looked like he couldd use a little TLC himself. Take care. The picture with Sam has left me with tears in my eyes.<BR/><BR/>So sad. My thoughts and prayers are with all of those effected by this tragedy. we join our aussie bro and sis and our global community in prayer for all the victims and the families affected by the brushfires. The world has your continent in its thoughts an d prayers right now. Sam has been all over the news here as a symbol of the cost to wildlife along with the human. Terrible times. What a lovely tribute. The stories I’ve seen and heard are all just so sad, those poor folks over there. Yay for Sam and his rescuers! 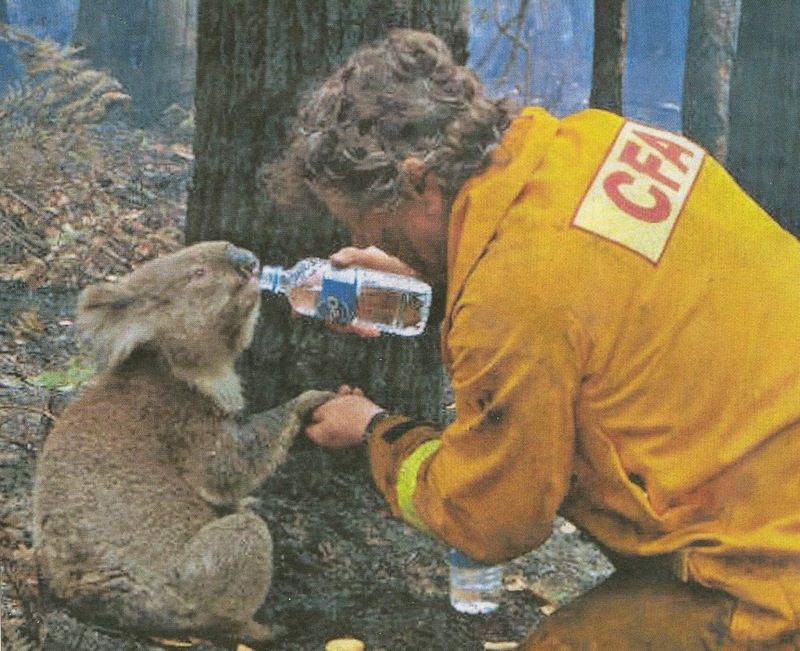 Holding everyone touched by this Australian disaster in my prayers including all of nature so helpless..<BR/>Amen to all volunteers on front lines doing what ever needs to be done! A terrible time, indeed – glad to hear you were safely removed from it, but many were not, and I join the others in our "extended blogging community" in wishing the country well. Oh my gosh, that image says so much! So sad, deeply moving and beautiful. Thank you. My thoughts and best wishes to those affected by the terrible fires and well done to the hero’s who help those affected and especially those that fight the fires. <BR/><BR/>Glad to know you are safe and so is Sam, poor mite. Wow – that flag photo really is moving. Thanks for finding it and sharing it with us. These fires have been absolutely horrific – but the nation’s outpouring of generosity has been so amazing. 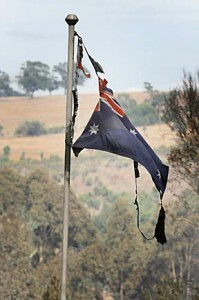 Your image of the Aussie flag is extremely moving. It’s been a surreal week in Australia hasn’t it? Floods in the north, fires in the south and shark attacks in our most famous waterways. For all its abundance, it can be a harsh country at times. Thanks for stopping by. Lovely to "meet" you. Our heartfelt condolences to your whole country. What a terrible tradgedy. But what a heartwarming story of little Sam!<BR/><BR/>Godspeed Australia. Love this post. Thanks for the "Sam" info. Such a sad ordeal for so many.<BR/><BR/>Hope your move goes well. I can tell from the creativity I have seen on your blog that you will make anyplace a home in no time at all. God bless all of you. Those fires are just terrible. Praying for all of you….<BR/><BR/>Kitty<BR/><BR/>P.S. – glad Sam is doing OK.
Leave a Reply to Linda Manning Findley Click here to cancel reply.